Mass spectrometry is a method for finding out the mass of particles contained in a sample and, thereby, for identifying what those particles are. 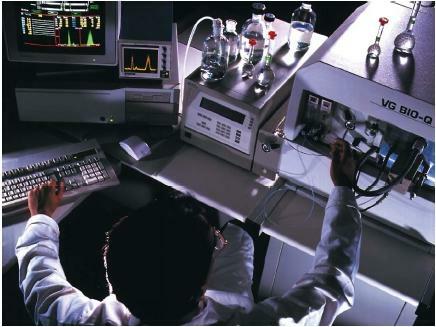 A typical application of mass spectrometry is the identification of small amounts of materials found at a crime scene. Forensic (crime) scientists can use this method to identify amounts of a material too small to be identified by other means. The basic principle on which mass spectrometry operates is that a stream of charged particles is deflected by a magnetic field. The amount of the deflection depends on the mass and the charge on the particles in the stream. A mass spectrometer (or mass spectrograph) consists of three essential parts: the ionization chamber, the deflection chamber, and the detector. The ionization chamber is a region in which atoms of the unknown material are excited so as to make them lose electrons. Sometimes the energy needed for exciting the atoms is obtained simply by heating the sample. When atoms are excited, they lose electrons and become positively charged particles known as ions. Ions produced in the ionization chamber leave that chamber and pass into the deflection chamber. Their movement is controlled by an electric field whose positive charge repels the ions from the ionization chamber and whose negative charge attracts them to the deflection chamber. The deflection chamber is surrounded by a strong magnetic field. As the stream of positive ions passes through the deflection chamber, they are deflected by the magnetic field. Instead of traveling in a straight path through the chamber, they follow a curved path. The degree to which their path curves is determined by the mass and charge on the positive ions. Heavier ions are not deflected very much from a straight line, while lighter ions are deflected to a greater extent. When the positive ions leave the deflection chamber, they collide with a photographic plate or some similar material in the detector. The detector shows the extent to which particles in the unknown sample were deflected from a straight line and, therefore, the mass and charge of those particles. Since every element and every atom has a distinctive mass and charge, an observer can tell what atoms were present in the sample just by reading the record produced in the detector. Credit for the invention of the mass spectrometer is usually given to British chemist Francis William Aston (1877–1945). Aston made a rather remarkable discovery during his first research with the mass spectrograph. When he passed a sample of pure neon gas through the instrument, he found that two separate spots showed up in the detector. The two distinct spots meant that the neon gas contained atoms of two different masses. Aston interpreted this discovery to mean that two different kinds of neon atoms exist. Both atoms must have the same number of protons, since all forms of neon always contain the same number of protons. But the two kinds of neon atoms must have a different number of neutrons and, therefore, different atomic masses. Aston's work was the first experimental proof for the existence of isotopes, forms of the same atom that have the same number of protons but different numbers of neutrons.